Packaged in custom litho-printed purple tin box. Includes character booklet and pin back button! 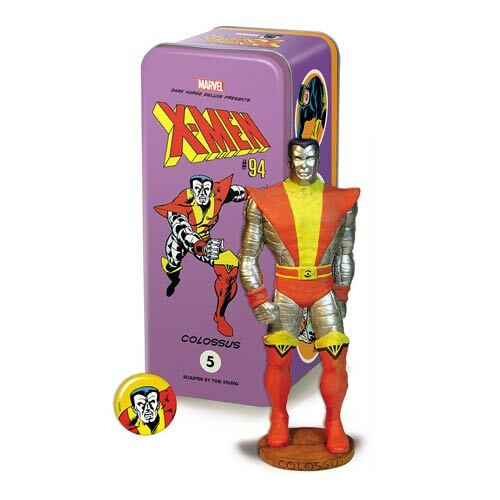 As featured on the cover of the 1975 release of Uncanny X-Men #94, it''s the X-Men Colossus Uncanny X-Men #94 Statue! A limited edition of 675 pieces, this 5 1/2-inch tall statue commemorates the moment all the previous X-Men except Cyclops were placed by a team of Wolverine, Storm, Nightcrawler, Banshee, and Colossus himself. It also marked the 16-year run on the title by Chris Claremont. The X-Men Colossus Uncanny X-Men #94 Statue comes packaged in a custom litho-printed tin box containing a character booklet and unique pin back button.